The above excerpt is from the journal of Lt. Frederick Schwatka who covered over 3000 miles on foot over ice, snow and tundra, along with 17 other expedition members and 44 dogs, returning to Hudson’s Bay in March of 1880. Once the initial provisions were depleted, the expedition’s only source of food was hunting and fishing. Many people go low carb/high fat for better health and vitality and at the same time exercise quite a lot. There is little to indicate that recreational physical activity performance is impaired by low carbohydrate feeding. However, the case for low carb/high fat diets for competition exercise is somewhat different. There are highly skilled sportsmen who admit to following a low carbohydrate lifestyle who still perform world class. In the recent 2010 Winter Olympics, Swedish biathlon performer Bjørn Ferry won the gold medal in12.5km pursuit. Ferry proclaimed following the gold medal that he would celebrate with some champagne and cream. He is known for following a low carb diet strategy. Colting follows the “train low-race high” principle where high carbohydrate intake is reserved for the immediate time around competition. There are many athletes who follow a more or less strict low carb dietary regimen with great success. However the scientific data to support this strategy is actually poor and close to non-existing. During the 80s and 90s and up until a few years ago there was a big interest in examining diets with different macronutrient composition as a means to enhance exercise performance. High fat diet (HFD) studies seem to have been especially popular during the nineties up until about 4 years ago, when the interest subsided. The declined interest came after several reviews concluded that high fat diets did not enhance performance and sometimes even caused a decreased performance and suboptimal adaptations to exercise. The foundation for these conclusions was poor. The fact is that there is a lack of well controlled longitudinal studies to conclude either way. In theory the performance enhancing effect of high fat diets is simple. Our body is fueled by two sources: food and stored energy. During exercise food is not an option so the required energy must be supplied by energy stores. These stores are either carbohydrate stored as glycogen in liver and muscles or fat stored in fat tissue and muscles. The amount of energy stored as glycogen isn’t really that much and after a brief bout of exercise the stores are emptied. The normal muscle glycogen stores of well trained athletes are generally sufficient to fuel activities up to 60–90 min. If we eat carbohydrate rich diets the body will get most of its energy from glycogen during exercise. If we on the other hand eat high fat the body will get a greater proportion of its needed fuel from fat. Moreover, the point of fatigue during exercise closely correlates with the reduction of glycogen stores beneath a certain point. If however we can make the body use fat as the primary energy source during exercise, glycogen can be spared and performance increased. The energy stored as fat also does not get depleted and so is not a limiting factor. The amount of glycogen stored in muscles are often estimated to be 300-900g and the amount in the liver about 80-100g. Although glycogen obviously is a short term energy source, the reliance on glycogen and carbohydrate for fuel is the norm in most forms of exercise. When exercise duration increases athletes simply keep consuming carbs during exercise and competition to keep glycogen stores from depleting. Many of us who have been involved in sports for some time are familiar with the concept of carbohydrate loading. It has been a part of sports literature from 1939. The concept stems from the1920 data of Krogh and Lindhard, who build themselves a homemade chamber where they were able to measure how different diets caused different respiratory exchange ratio (RER). The carb for sports supremacy came about following a 1939 study by Christensen and Hansen who did a crossover study with a low carb diet, a moderate carb diet and a high carb diet, each for a period of 1week. After each diet, time to exhaustion was measured on an ergometer bike. Compared to the low carb time of 81min the subjects cycled for 206min on the high carb diet. Since then, the consensus has been to feed athletes large amounts of carbohydrates to fill glycogen stores to the max, and this is still the norm. Close to everything about exercise performance and diet has been about trying to increase glycogen stores, because glycogen depletions and fatigue coincide. Athletes are commonly recommended a diet of 60 – 70% carbohydrate for optimal performance. In addition, during prolonged activity it is common to consume large amounts of sugary beverages to stock up on carbs. Last, but not least there is an important physiological mechanism behind the whole “carbs for competition.” Unlike carbohydrates, fat cannot be oxidized under anaerobic conditions. This means that as soon as we reach high intensities, as we commonly do during competition speeds, carbohydrates has to be our primary energy source. As seen in the above figure, carbohydrates are the main fuel source during high intensities while fat dominates at lower intensities. When exercise intensity increases the body cannot take up and supply sufficient oxygen to support the oxidation of fat. During prolonged low intensity activity the blood flow in the adipose tissue increase. This increases the rate of fat delivery from fat tissue. During high intensity exercise sympathetic vasoconstriction decrease adipose tissue blood flow, fatty acids accumulate in the fat tissue and the amount of fat transported to muscles decrease. This also contributes to the low fat oxidation rates at high intensities. I know this last bit seems a crucial point. No competition exercise is performed at low “fat burning” intensities. Even in marathons or triathlons intensities goes up and down and an athlete need the ability to sprint or to rely on glycogen for shorter periods of time. But maximal fat oxidation rates differ immensely and in some fat oxidation is not suppressed until intensities reach well above 80% VO2max. Muscle glycogen and plasma glucose can contribute 130kJ of energy per min (32kcal/min) during high intensities. Fat is more slowly used and can supply in the area of 6-7kcal/min. The carbohydrate stores are quickly depleted during prolonged high intensity exercise, but the stores are also quickly refilled when carbohydrates are eaten. In the end carbohydrates can supply more energy per time unit. It can supply energy even at high intensities, but the depletion of glycogen is when exhaustion sets. Fat on the other hand is burned slowly. It cannot supply energy during high intensities, and eating a high fat diet may lead to smaller glycogen stores. However, the amount of fat stored is never a limiting factor for performance. I’ll admit that, based on the above, the case for going high fat is not strong. But there is still hope. The rules governing the human metabolism are not set in stone. They can be bent and stretched to better suit our needs. The body is adaptable, very adaptable. A chronic high fat diet cause a marked shift in substrate use compared to high carbohydrate diets. Interestingly, the adaption in substrate use caused by high carbohydrate intake is close to instantaneous, whereas the adaptation to a high fat diet can take weeks. In addition, the adaptation persists for some time after carbohydrate intake is increased and glycogen stores refilled. It is possible to maintain an increased fat oxidation while having full glycogen stores. This strategy, though similar to carbohydrate loading is actually more of a fat loading and very much like the “train low-race high” principle. When we start eating high fat we gradually get better and better at burning fat. If we are well trained, we also burn more fat at higher intensities. Fat is released faster and in greater amounts from the fat tissue, it is also transported faster into the muscles and the mitochondria. The muscles also store more energy as fat and get better at using this fuel as well. Full adaptation takes time tough, and it is likely that optimal adaptation need >4 weeks. High fat diets cause a shift in the expression of our genes into coding for several of proteins involved in fat metabolism. 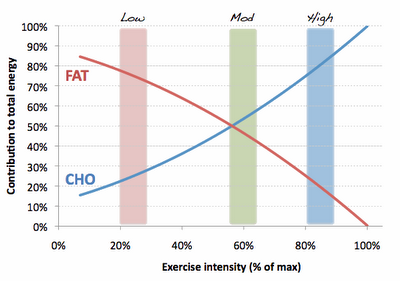 After adapted to high fat diets we can oxidize more fat during exercise and we get a higher maximal fat oxidation. Endurance trained athletes are particularly adept at burning fat. An endurance athlete adapted to a high fat diet is a fat burning machine. Still, endurance trained athletes are not a homogenous group and may differ greatly in their fat burning capacity. Achten and Jeukendrup tested 55 endurance trained athletes to find maximal fat oxidation and at what level of intensity it occurred. 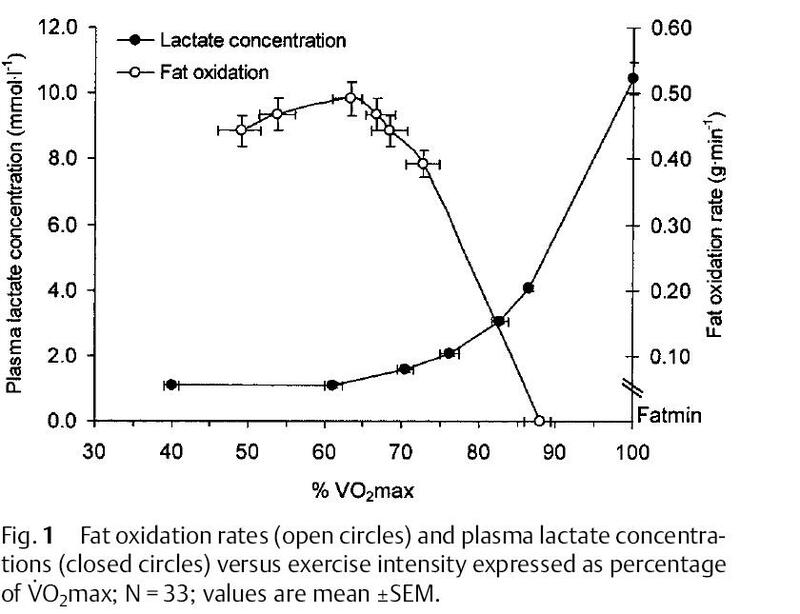 Maximal fat oxidation averaged 0,52g/min at an intensity level of 63% VO2max. But there were large variations in both maximal fat oxidation and the rate of fat oxidation. Although the average intensity for maximal fat oxidation was at 63% VO2max some athletes cycled at more than 85% VO2max before fat oxidation declined, while in others it went downhill when reaching 50% VO2max. This study used a high carb diet and the exercise was performed after an overnight fast. Knechtle and coworkers found a higher fat oxidation at 75% VO2max than at 65% and 55% VO2max for both men and women and in both running and cycling. This intensity was related to the lactate threshold for both sexes in cycling. Achten and Jeukendrup also showed that the first increase in lactate coincided with maximal fat oxidation. Venkatraman et al (2001) examined the effects of increasing dietary fat on endurance exercise as measured at 80% VO2max. 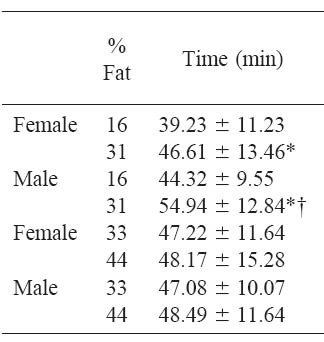 14 trained runners serially consumed a 15% fat diet, a 30% fat diet and 40% fat diets for four weeks each. In the last week of each diet period the subjects ran to exhaustion at 80% of their VO2max. On the 15% diet, the women ran 39.2 min. and the men ran 44.3 min. Increasing dietary fat to 30% significantly increased the running time to exhaustion by 19% for women (46.6 min) and 24% for men (54.9 min). Increasing the dietary fat to 40% did not significantly increase endurance time, compared to the 30% diet. 30% fat is not a high fat diet, but the results mirror many similar studies that indicate a negative effect of reducing fat to below “normal” levels. For example, in 2000 Horvath et al examined 12 male and 13 female runners who ate diets providing 16% and 31% fat for four weeks. In addition, six men and six women increased their fat intakes to 44%. Endurance and VO2max were tested at the end of each diet period. Although the diets were designed to be isocaloric the runners on the low fat diet ate 19% fewer calories than on the medium or high fat diets. The endurance test was a run to exhaustion at 80% VO2max. The table below shows the timed run to exhaustion after the different diets. The endurance time to exhaustion in the subjects on the medium fat diet increased 20% in females and 8% in males compared to the low fat diet. Muio et al (1994) examined the effects of dietary manipulations on six trained runners. The runners were given diets of 38%, 24% and 15% fat each for 7 days. Running time to exhaustion at 75- 85 % VO2max was greatest after the 38% diet with 91.2min as compared with the 15% diet with 75.8min and the 24% diet with 69.3min. VO2max was also higher on the 38% diet. The results imply that restriction of dietary fat may be detrimental to endurance performance. A much quoted study is one from Stephen D. Phinney from 1983. He put 5 endurance trained athletes on a ketogenic (85% fat) diet for 4 weeks. After the diet period the athletes did not have a significant reduced performance on a 150min test at 62-64% VO2max, and the results almost seemed to point to an advantage. However, four of the cyclists showed little change while one participant had an almost abnormally large improvement. It is difficult to say if this improvement was caused by diet or whether this athlete just had a very good day. In 1999 Silvia Pogliaghi and Arsenio Veicsteinas had fourteen untrained men sequentially submitted to 4 weeks eucaloric diets (30%, 15%, 55% fat). After each diet period, VO2max and endurance (time to exhaustion at 75% VO2max) were measured. Neither VO2max nor endurance time were significantly modified by the different diets. Although time to exhaustion was greater during high fat than low fat the difference was not statistically significant. Vogt et al (2003) also saw no decrements in performance after a HFD. 11 athletes did 5weeks of HFD (53%) or low fat diet (17%) and were tested at both moderate and high intensities. Half marathon running time differed only 12sek between diets. Vogt also showed that glycogen stores were maintained on the HFD. In contrast to Vogt, Lambert and colleagues (1994) who used a 2 week 67% fat or 12% fat diet, showed reduced glycogen stores in 5 trained cyclists. But unlike Vogt they observed an improved performance measured as time to exhaustion at 60% VO2max. The study shows that a diet with more than 60% fat may make it hard to maintain full glycogen stores, but also that these stores do not necessarily play an important role at these intensities. The same study observed no differences between the diets when tested at 85% VO2max. The actual time to exhaustion on the 60% VO2max test was 79.7min in the HFD and 42.5min in the low fat group. In 2003, Fleming and coworkers, assigned twenty non-highly trained men to either a HFD (61% fat) or control (25% fat). The men were tested before and after 6 weeks. The HFD group lost on average 2.2kg, but also showed small decrements in peak power output and endurance performance. The HFD group also reported increased ratings of perceived exertion. Interestingly, the average reported energy consumption in the two groups was 2335kcal and 1815kcal in the HFD and low fat groups respectively. It is important to remember that although some averages are not statistically significant, an improvement of for example 4% during the last 42km of a triathlon would equate to a 6min 36sek improvement in a goal time of 2h 40 min. Although many studies show only small or no performance improvements, not many studies show an obvious decrease in performance. In 1989 Kathleen O’Keefe and colleagues had seven highly trained female cyclists follow a low carbohydrate diet (13% carbs), a medium carbohydrate diet (54% carbs) or a high carbohydrate diet (72% carbs). The diets were isocaloric and followed for one week. After each week the subjects exercised at 80% VO2max to fatigue. Average time to fatigue was 60min for low carb, 98min for medium carb and 113min for high carb. Thus a low carb diet in this case caused a marked decrease in exercise performance. However, mark the 1 week intervention. In 1999 Julia H. Goedecke and colleagues tested a 15 day HFD period in 16 endurance trained cyclists. They were randomly assigned to control diet (30% fat) or HFD (69% fat). The cyclists were tested on a 2.5hour constant load ride at 63% VO2max followed by a 40km time-trial. 90min before each trial subjects consumed 400ml 4.3% MCT solution. At the start of the trial the same solution was ingested containing 10% glucose. Thereafter 200ml of the glucose+MCT was consumed every 20 min until 40 min into the time-trial. 40km time trial went from 69.9 min to 65.6min in the control diet (-3.3min) and from 69.3 to 63.4min in the HFD group (-5.9min) indicating an advantage of HFD. Several studies have examined the effects of HFD periods followed by carbohydrate loading on performance. One of these studies was performed by Burke and coworkers. The strategy was 5days HFD followed by 1 day high carb. Average time trial time was 8% faster with this strategy compared to constant high carb. More interesting is the observation that the increased performance was mostly due to two participants who improved greatly following the HFD. The same subjects showed symptoms of severe fatigue and hypoglycemia toward the end of testing on high carb diet. This observation might indicate that HFD can be especially effective in individuals who may experience hypoglycemia during prolonged activity where carbohydrates are not ingested during exercise. Neither high fat diets, nor high carbohydrate diets, have shown consistent improvements in scientific studies. All in all the results indicate that HFD have a greater positive effect in trained athletes than in untrained. But there are major weaknesses with many of the studies if we want to know whether HFD actually work. First of all is the time to adaptation. Often studies are done with less than 4 weeks intervention which is not much time for the body to fully adapt. There are also many other nutritional factors which are little controlled for, e.g. protein intake, vitamin and mineral status and fatty acid composition, carbohydrate type, etc. There is little clear evidence of a performance enhancing effect of high fat diets. However, there are too few longitudinal studies to conclude sufficiently and the studies we do have differ in their results. Although the big picture looks inconclusive there exist definite findings of performance enhancement. In addition there is some circumstantial evidence from studies – individual performances, and there are the stories from athletes using the approach. The studies we have to base our conclusions on are generally not designed to optimize all conditions and are often of too short duration. There are many nutritional factors beyond macronutrient composition that affects fat oxidation during exercise. The existence of these influencing nutritional factors make it difficult to interpret results, but make it likely that conditions can be optimized and, if so, yield better results than the observed averages in many of the studies. It is natural that any performance enhancing effects of high fat diets are most likely to be seen in long duration sports such as marathon or triathlon. The “train low-race high” strategy, where carbohydrates are used at specific times to enhance performance, is likely a good strategy and also make physiological sense. Very nice post Pal. Well researched and balanced. Excellent…Although this is about endurance exercise, I would like to add that I have personally never had performance decreases in weightlifting or sprinting with high fat (my endurance is awful regardless of diet). Thank you Ned and John! Appreciate it. There is no obvious reason why sprinting or weightlifting performance should decrease, at least not at a recreational level and given enough rest between intervals. But there is even less data on HFD and anaerobic exercise to make conclusions. Good, well thought out post, as usual. Not to sound like a broken record but I keep wondering about what happens years up the road. What is the net effect of «carb loading» on blood sugars, beta cell functioning and insulin resistance? I put in thousands of miles of cycling using carbs and the net effect I see is a broken metabolism. There is much more to this than enhancing one's VO2 max. No broken record. I am wondering about the same thing, but I haven't found any good data on it. To be honest, I have a feeling years of carbohydrate loading might be very detrimental to the metabolism. Increasing VO2 max; would that be a sign of a much higher max pulse (223!) after six months in ketosis? Uhm.. not sure I understand the question anonymous. If max heart rate goes up it is not unlikely to also measure increased VO2 max. If you experience an increased max HR after a dietary change it could be due to an increased ability to reach the exercise intensity that elicit max HR. It could also be due to an increased sympathetic activity and increased levels of catecholamines. Have you seen this paper recently through? I've seen it, but haven't gotten around to reading it yet. Sounds interesting. Also don't have access to full txt from home. You should make it a part of the great series you've started. Great post! I was starting to research my master's thesis on this topic and came across this… You wrote everything I would have said in a more elegant fashion so I've since changed topics. ha. When research is shown on the crossover points of carb and fat burning, I'm not convinced these tests have ever been done on a large scale with people who are long-term adapted to fat burning and have been on a Paleo – style diet for more than a year. I think you'd find my results interesting. I can email you the print out from the machine if you'd like. My RQ is 0.70 at a HR of 160 and 0.79 at a HR of 178 BPM. I don't think most people would consider that to be possible. I had the test done at the same facility on the same machine a year prior (when I ate well but not a strict paleo diet) and the numbers were in the normal range. Thanks Jeff. I think there's a lot more to this subject than what I've written here, but I guess this post was not the only reason for you to change subject. You're right that there is almost no data of long term adaptation to low carb or paleo style diets. I think it would be hard to find subjects for a study of this. I've heard of individuals in the lab scoring around RQ .7 at similar intensities, but only rarely. How much carbs were you eating and was this in a fasted state? Your definitely a fat burning machine. I have been on a ketogenic diet for around 5 months and have completed a few 4 hour races this year where I raced in a fasted state and drank only water with salt tablets. My average HR during the races tends to be around 88% of max HR. I have a 100km (60 mile) mountain bike race coming up and have seen the talk of train low – race high. What I am trying to work out is if the extra 1 to 1.5kg I am likely to put on from replenishing my glycogen stores makes sense in terms of the expected benefits, especially given there will around 2500 meters of climbing. Do you have any thoughts? Hi Ian. I'm all for training low and racing high. Starting a race with maximum fat oxidation and maximum glycogen stores makes perfect sense and seems to work very well for many. I would not think the extra body weight gained in any way cancels out the benefit of the extra glycogen although I haven't seen any hard data on this. Jeff are you still on this site. Not all fat is the same, Polyunsaturated fats cause inflammation. Saturated fats in increase glycogen storage and utilisation compared to PUFA. Medium chain triglyceride (in coconut oil) are absorbed directly into the portal blood and dont need the CPT enzyme.. The studies on high oil are confused because of the different types of oil/fat being used. Oils aint oils.